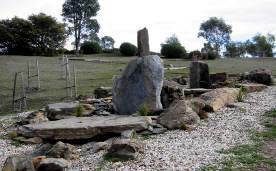 A large selection of rocks, boulders and flat stone slabs to choose from, sizes up to 8 tonnes. The Pyrenees stone is a mixture of black slate and grey quartzite, often with burnish colouration on the outer surfaces. These rocks may be cut, drilled or shaped (within practical limits) to fit your design. retaining walls, terracing or feature stones. A large selection of blocky rocks to boulders to choose from, sizes from fist size up to 8 tonnes. 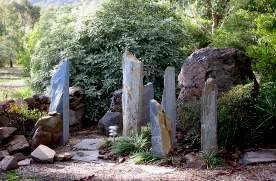 Stone types include the Yapeen and Chooky Yellow Sandstone. Rock colours range from yellow to orange to brown, occasionally with white quartz bands. 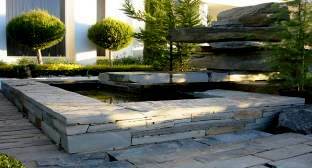 These rocks may be used for terracing, OR cut, drilled, shaped (within practical limits) to fit your design. This is a medium grey speckled granite. Large rocks up to 5 tonne available, either as natural break or they can be quarried to your dimensions as blocks or tapered obelisks etc. These rocks may be cut, drilled or shaped (within practical limits) to fit your design. Available from fist size up to 5 tons, natural edged vesicular basalt, dark blue grey with the surface often coated with red/brown oxides. These rocks may be cut, drilled or shaped (within practical limits) to fit your design. A yellowish coloured massive sawn sandstone, comes in big blocks and slabs, suitable for making architectural features such as sills etc, and general building purposes. Rocks can be ordered to your requirements. Current stock include sizes up to 500x500x500mm approximately. Angular quartz boulders up to 1 tonne, often with some orange/brown oxide staining (not always available). FOR FEATURE PHOTOS view our “PHOTO GALLERY” from the “PRODUCTS” heading page.